The main reason for the drive to the “old neighborhood” was to head to the Hai Getron (Armenian Community Center) on 6705 W. Lafayette. 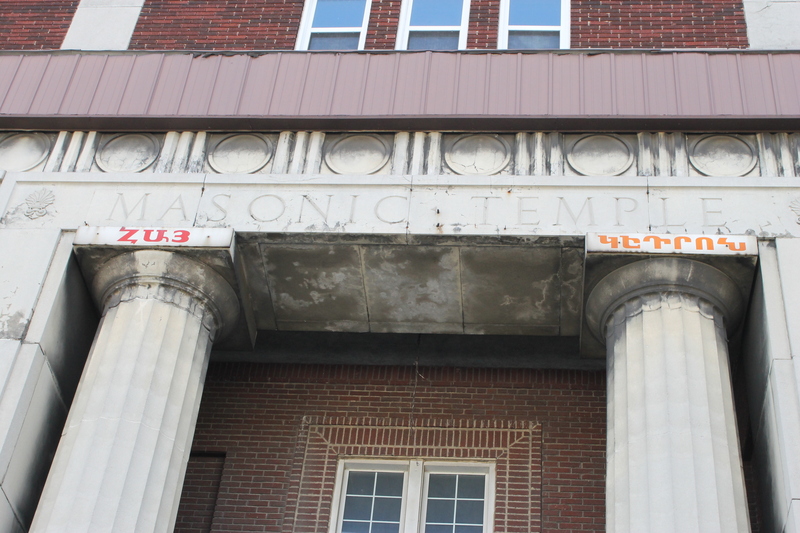 Known as the Findlater to most of the Armenians, the building – which still exists – was a Masonic Lodge built in the early 1920s and it was referred to as the Findlater Lodge. After much research, I was able to reach the owner of the building and cold called him, told him who I was and about the film. I asked to come out to pay the building a visit and film inside. He said yes. The smile on my face could be seen through the phone. I got chills when I approached the building. You would have thought I was a kid going to the carnival. 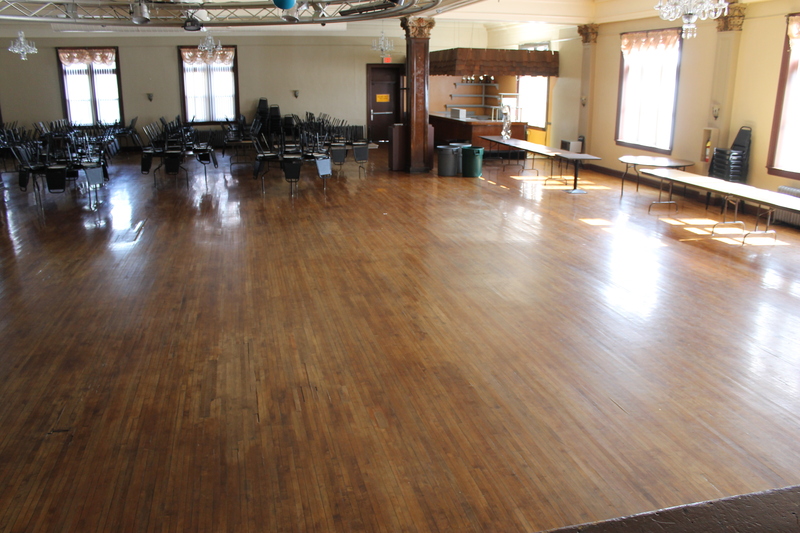 I had been to the Findlater only once before, but that was over twenty years ago and it was for a reunion dance organized by Ned Apigian. It was a great event and the banquet hall was filled with Armenians and music. The building, for the most part, looked the same from the last time I saw it. Although it showed its age (but after all) this building was close to 90 years old and in my opinion – in great shape. The front of the Findlater, notice above each pillar the words Hai and Getron. As you can imagine, this isn’t the best of neighborhoods anymore. I saw a pit bull dog loose roaming the neighborhood, padlocked gates, and abandoned homes adorn the neighborhood. Still..I felt safe. Brian and I entered the building to look for Miguel, he was the owner that allowed me to pay a visit. The building now occupies a few businesses. The basement is where the Armenian Youth Federation would hold their meetings with some parties and a coffeehouse was still used for similar activities. Now a full bar and pool room with offices, perhaps the most renovations to the inside of this building occurred in the basement. 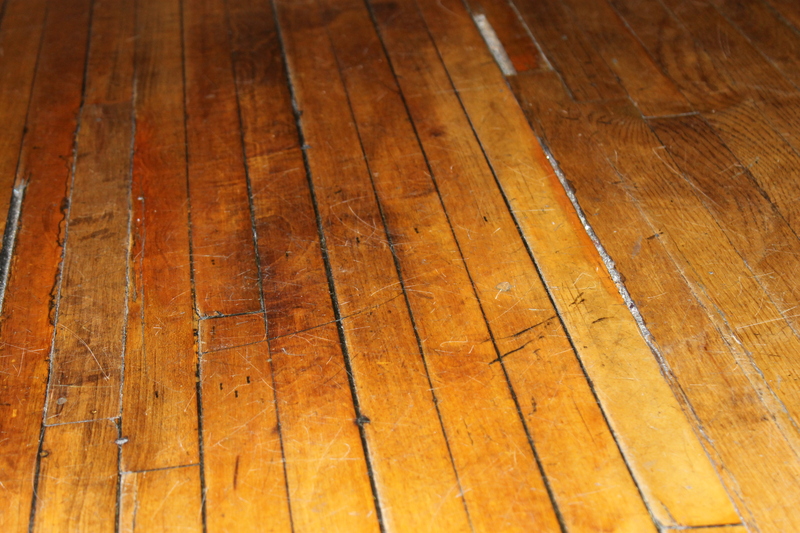 The original wooden floor in the main hall. The main hall of the Findlater and how it looks today. that I thought they did an outstanding job preserving the hall. He smiled and said they wish they could renovate it, but the money to do so just isn’t available. I must have took 20 pictures of just this empty room. They still rent out the banquet hall for meetings and weddings whenever possible. This was the only room I had ever been in but inquired if it was possible to go upstairs and Miguel was happy to oblige me. I have only heard of the church services that occurred upstairs – but never saw it. I am sitting on the same stage that once had dozens of Armenian musicians belting out music to a packed hall! I took this photo form the balcony so you could see the layout of how the church was set up. What an amazing room. 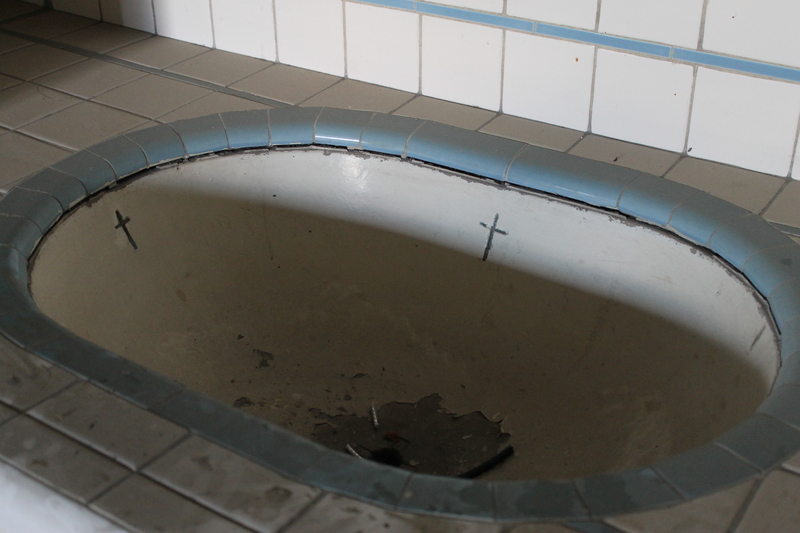 The only real memories of the Armenians using this as a church were the two baptismal sinks – still in great condition. One behind where the alter would have been and another on the side of the stage. I am pretty sure this floor was not used since the Armenians occupied the building. 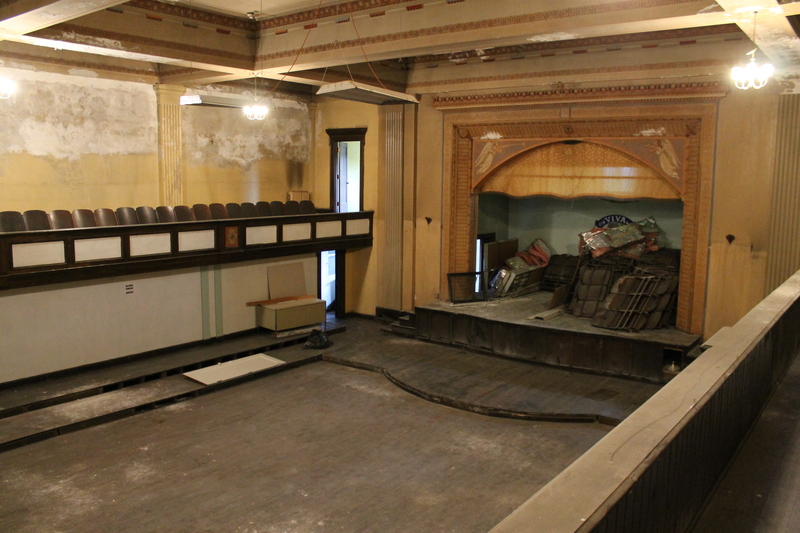 After my visit, I mentioned to friend Greg Vartanian (who lived in Delray) about my tour and he told me that perhaps Al Capone used this particular floor to rough up non-supporters prior to the Armenians occupying the building. It is hard to put in writing the feeling one gets from this visit, but I was so happy Miguel allowed me to come there. To him it wasn’t a big deal to show me which really speaks to the point that there are still good people living in the inner city. 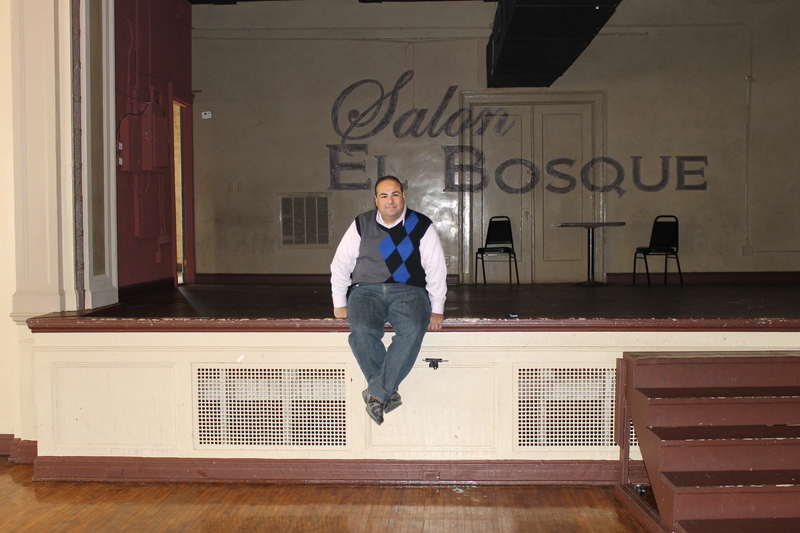 Thank you Miguel and Salon El Bosque for allowing me to create new memories. The photo on the left is from 1931 (courtesy of Wayne State University) and the photo on the right is what it looks like today. For our pilgrimage into Detroit, I had composed a long list of locations, knowing full well that most of the buildings were probably torn or burned down. After visiting the Findlater, I decided the rest of the list wasn’t as important – but I had one last stop on the way back home that I wanted to visit. Since I had an exact address – 1335 Oakman Blvd (Again, thanks to Simon!) I decided I wanted to visit the original St. Johns Armenian church. Now, a Baptist church, to my pleasant surprise, the Armenian lettering was still intact in the concrete along with an arch at the top – Armenian Apostolic Church. 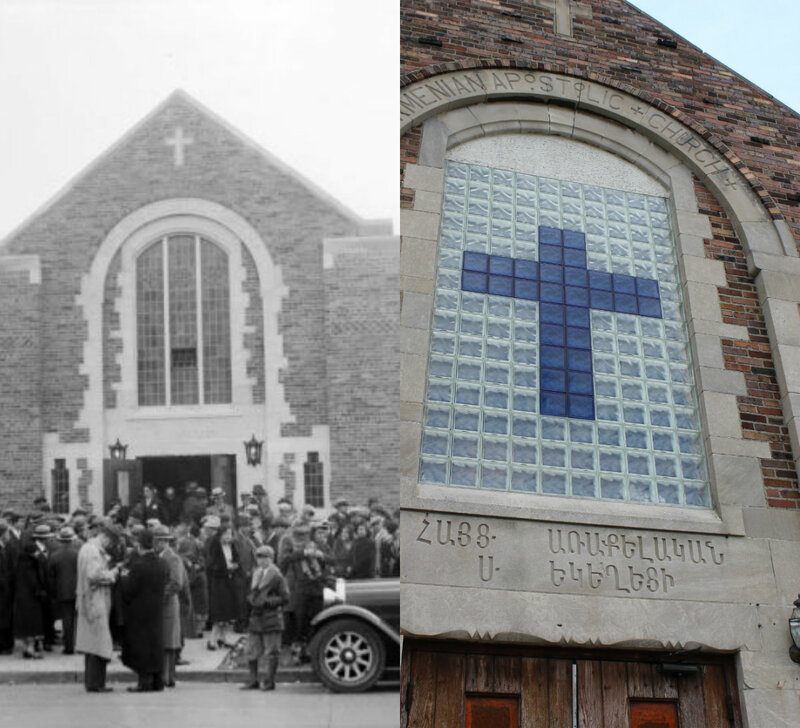 I have an old photo of the church from 1931 and it is virtually identical. Again, our heritage still intact in Detroit. I cant wait to use some of the film footage in the final documentary as these may be the last memories Armenians will see of these structures. Check out the rest of the pictures in my next blog entry. Thanks Detroit. This entry was posted in Uncategorized and tagged Al Capone, Armenian, baptism, building, church, delray, Findlater, Lafayette, Masonic, music, musicians, Oakman Blvd, southwest Detroit, St Johns, Topouzian. Bookmark the permalink.